LA gets Philips SmartPole Lighting System | SmartHomesNow! If you’re going to live in Los Angeles, California USA, or you’re already living there, then we envy you. We know it’s great place to live but it’s going to be even better now. Why? Well, it’ll be the first city in the world that will have Philip’s SmartPole Lighting System. Now it’s not just a Lamp Post or a really cool energy efficient lighting system, which it is by the way. It’s great because it’s integrated with Ericsson’s 4G LTE wireless technology. With this SmartPole Lighting System, LA’s citizens will also get wireless data broadband coverage. 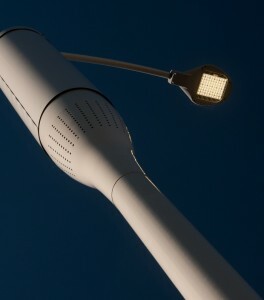 Philips will deploy 100 LED light poles with the new small cell technology. And host mobile network operator equipment. LA citizens and businesses will get efficient public lighting but also improved network performance. LA has been one of the more forward looking cities in North America. They want theirs to be a sustainable one. They want meet some of their sustainability goals by reducing energy consumption. They also want to reduce urban clutter. Well, they’ve been busy. Earlier this year, LA utilized Philips CityTouch to track and control its street ligthing. Philips CityTouch is a streetlight asset management system that uses mobile and cloud-based technologies. It lit streets better contributing to safer streets and helped prevent accidents. With bitter lit streets, it even helped deter crime. That’s on top of reducing the LA’s enery consumption. The Philips SmartPoles will not only light streets better, it’ll help moible network performance. It’ll accept wireless mobile network operator equipment. Philip says SmartPoles is an alternative deployment plan for 4G LTE broaband services. It’ll be able to connect each pole through a fiber link to its core network. It also helps scale mobile wireless 4G/LTE infrastructure deployment beyond traditional sites. As a result operators can improve data coverage and capacity for citizens. You won’t have to suffer through more signal dropouts. We think that this is a great development in LED light development. We mentioned before that LED lights might be the trojan horse to get into home and city planning. Well, it’s happening already. This new LED Light development has us pretty stoked. Imagine rolling out these Smart Lamp posts all over our metropolitan areas. It’ll make city lighting more efficient and it’ll even help decongest mobile network traffic. No more slow Internet connections or the signal dropping off. We hope we see something like this in the Philippines. For more information, visit the Philips web site or click here.